The new Gigabyte iSolo 230 chassis is available in black, metallic and in silver, whereby we reviewed the black version in this test report. 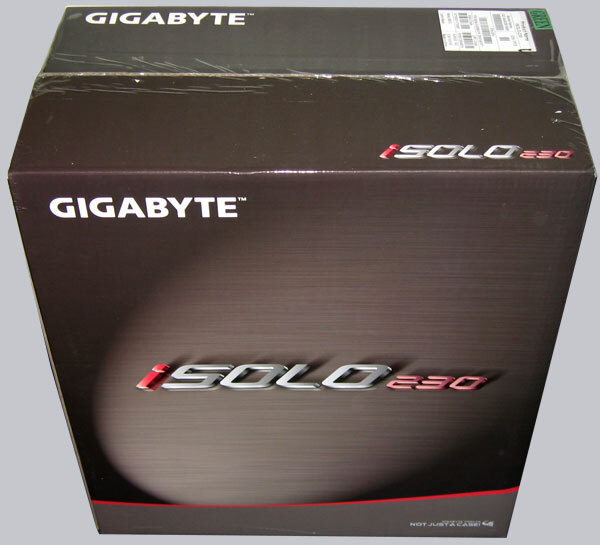 Gigabyte set with the iSolo 230 a high value on the design, but also on a nice finish and a very good air flow. Above all, several small features like the blue illuminated power button and the preparation for a water cooler enhance the result. The iSolo230 Black ATX Midi Tower GZ-AA3CBI-SNB (GZ-AA3CBI-SNS or GZ-AA3CBI-SNG) has a current price of 80 Euro (01/2009) and is of course also available at our sponsors. 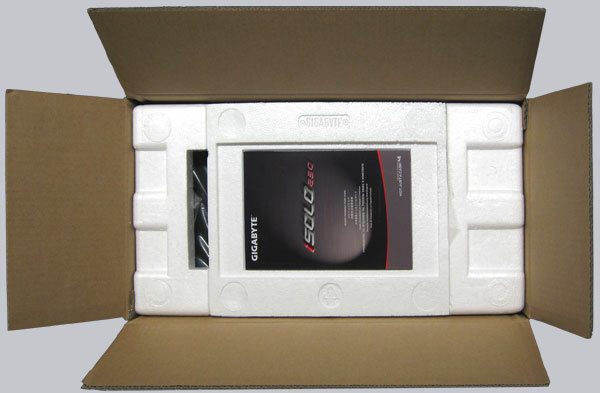 The iSolo 230 case comes in this cardboard box. 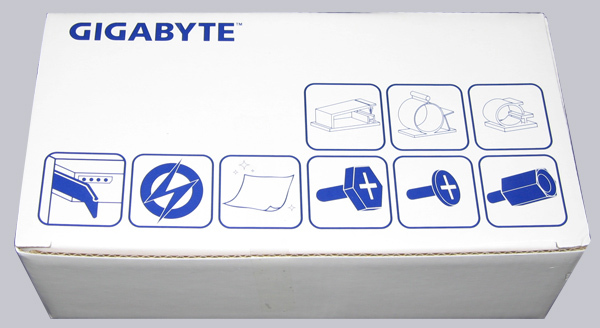 After opening the cardboard this small polystyrene box is noticeable, where one could assume the accessories. But far from it, because just the manual is almost indestructibly stored there. The multilingual manual is by the way clearly better illustrated on the English pages. 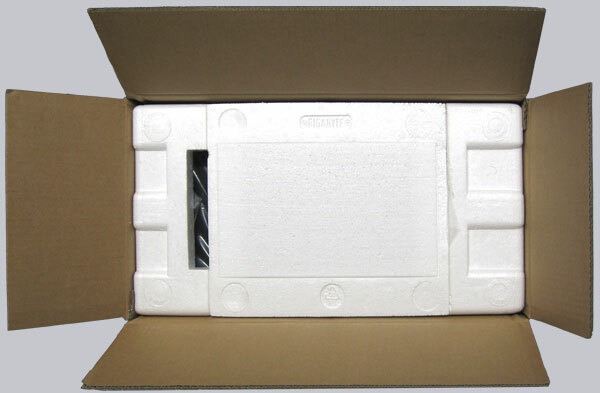 This small cardboard can be found inside of the chassis and contains the accessories. Here is the content of the accessory box. 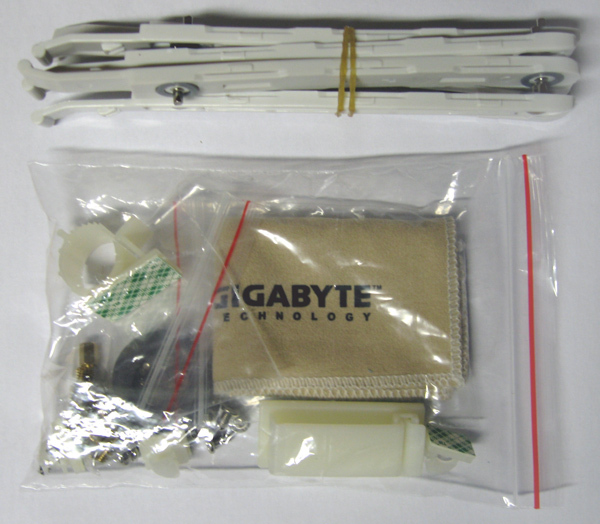 It contains some drive assembly rails, spacer and screws for the motherboard assembly, screws for the power supply assembly, ferrite ring and really helpful are the three small and two larger adhesive cable reels, as well as a Gigabyte dust remover cloth. The dust remover cloth lets assume rightly that parts of the case front panel are scratch sensitive.